Ghana's Minister of Environment, Science, Technology and Innovation, Mr. Mahama Ayariga has held bilateral talks with his counterparts from various countries and heads of some international organizations at the United Nations headquarters in New York on ways to boost cooperation with them and to fast track the implementation of the Paris Agreement to protect the environment. The meetings held separately with Mr. Vidar Helgesen, Norwegian Minister of Climate and Environment,Mr. Lars Chr Lleeholt,Danish Minister of Energy, Utilities and Climate, the Green Climate Fund,United Nations Development Programme, Ms Adrina Dinu, and Baron Lord Bourne of the United Kingdom's Parliamentary Under Secretary of State for Climate Change and Parliamentary Under Secretary for Wales,were held on the side lines of the historic signing of the Paris Agreement to protect the environment. During the separate discussions, Mr Ayariga said that the Ministry had prepared an investment plan to operationalise and implement Ghana's Intended Naturally Determined Contributions.(INDCs). This will make it possible to track progress and achieve a collective ambition level sufficient to limit global warming to below 2°C relative to pre-industrial levels. To this end, INDCs shall comprise a mitigation goal which represents a progression beyond current undertakings. 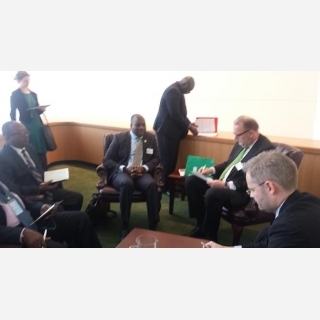 The Minister expressed his appreciation for the Danish government's support for Ghana's Climate Change local solution,assistance for climate change projects for developing countries. Mr Ayariga mentioned that current initiatives in place are what is needed at this time, especially innovations for climate change. Currently,he said that the country was focussing more on energy sector, by developing capacity for solar and other forms of energy. The discussions also touched on technical and financial resources for effective implementation of plans as well as partnership for Action on INDCs, which is being aligned to the anticipated Ghana 40-year development plan. Mr. Ayariga took time to explain the implementation of the priority actions to support Ghana's Environmental policy,National Climate Change policy, National Energy policy, Food and Agriculture Sector Development policy and the National Plantation Development strategy. Further more, he indicated that the total cost for the implementation of Ghana's INDCs amounted to $22.6 billion for the 10-year period and stressed the need for international support in mobilizing resources to execute the work ahead. To accelerate the progress of the work, Mr. Ayariga called for the early inflow of resources to beef up the Ghana government's domestic mobilization of resources as a means to leverage $16.3 billion from the public and private sources. On their part, they all commended Ghana for the good work it had done so far and assured of continuous support and cooperation in order to maximise the benefits.